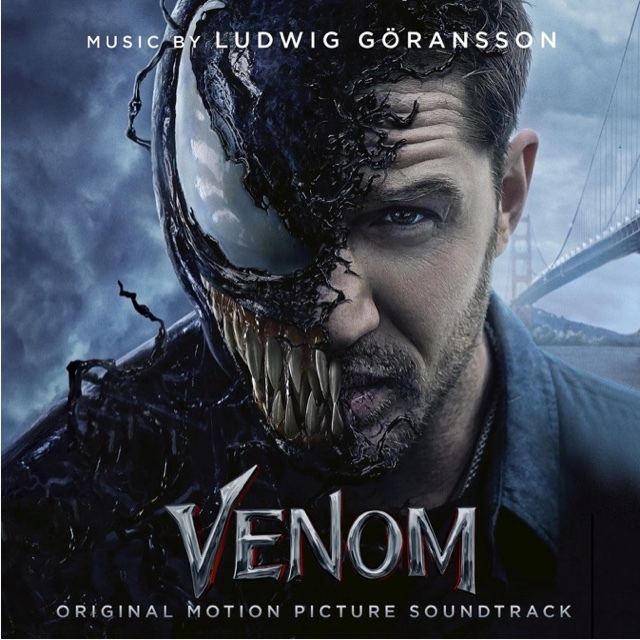 (September 26, 2018) - Sony Music announces the release of VENOM (Original Motion Picture Soundtrack) on October 5 with original music by three-time GRAMMY Award nominee Ludwig Göransson (Black Panther, Fruitvale Station, Creed, Atlanta). In advance of the soundtrack release, Collider is exclusively streaming "Pedal to the Metal", here: http://bit.ly/2Q6KwZx. Amongst an impressive resume of TV and film credits, Göransson is best known for his collaborative work with Donald Glover, producing records under the Childish Gambino pseudonym, including the critically-acclaimed and GRAMMY® Award-winning album Awaken, My Love! One of Marvel's greatest and most complex characters takes center stage as Eddie Brock (Tom Hardy) becomes the host for the alien symbiote Venom. As a journalist, Eddie has been trying to take down the notorious founder of the Life Foundation, genius Carlton Drake (Riz Ahmed) - and that obsession ruined his career and his relationship with his girlfriend, Anne Weying (Michelle Williams). Upon investigating one of Drake's experiments, the alien Venom merges with Eddie's body, and he suddenly has incredible new superpowers, as well as the chance to do just about whatever he wants. Twisted, dark, unpredictable, and fueled by rage, Venom leaves Eddie wrestling to control dangerous abilities that he also finds empowering and intoxicating. As Eddie and Venom need each other to get what they're looking for, they become more and more intertwined - where does Eddie end and Venom begin? "As a fan of the Venom comics - it was an intriguing challenge for me to write music for two incredibly explosive characters cohabiting one body," says Ludwig about the project. "The challenge was in creating two separate identities at the beginning of the story that could later be interwoven and coalesced. For the Venom score I drew on my roots as a metal guitar player. I set out to redefine metal by contemporizing it with current production techniques and infusing it with the super power of the orchestra." Directed by Ruben Fleischer, Columbia Pictures' Venom makes its way to North American theaters October 5, 2018. Based on the Marvel Comic, the screenplay was written by Jeff Pinkner & Scott Rosenberg and Kelly Marcel with the screen story by Pinkner & Rosenberg. The film is produced by Avi Arad, Matt Tolmach and Amy Pascal. David Householter, Stan Lee, Kelly Marcel, Tom Hardy, Edward Cheng and Howard Chen serve as executive producers. Scott Haze and Reid Scott also star. Ludwig Göransson is a Los Angeles-based Swedish composer, producer and musician. After earning his breakthrough assignment in 2009 on what would become the long-running sitcom Community, he concurrently worked on New Girl and Happy Endings, among other TV series. During his time on Community, he also found work on feature films including the comedy We're the Millers and the biopic Fruitvale Station, both released in 2013. Demonstrating his hands-on interest in genres beyond his screen work, Göransson collaborated with Community cast member Donald Glover on Glover's rap releases under the Childish Gambino pseudonym, including 2016's critically-acclaimed album Awaken, My Love!, which earned the rapper a GRAMMY Award for Best Traditional R&B Performance for the album's hit single "Redbone." Göransson also started his own solo project under the name Ludovin, releasing the indie pop EP How to Find a Party in 2013 while finding time to collaborate with other recording artists, including HAIM, Chance the Rapper, Pell and more. Community ended its run in 2015, a year that saw Göransson's scoring work in the critically acclaimed Rocky franchise entry Creed. His third collaboration with director Ryan Coogler and actor Michael B. Jordan was for the score to the blockbuster superhero flick Black Panther, which arrived in 2018 and charted #1 on the Billboard World Music chart.